What can we learn about creativity from a person who becomes trapped in their own thoughts and unable to connect with the world or contribute to it in a meaningful way? What can we understand about the nature of creative insight from someone who has fully committed to killing themselves? Why is the Golden Gate Bridge, the most iconographic landmark of the single most creative and innovative region in all the United States, also the world’s number one suicide destination? In this timely and provocative book, creativity expert Austin Hill Shaw presents a new and illuminating view on the nature of creativity by delving deep into its shadow. 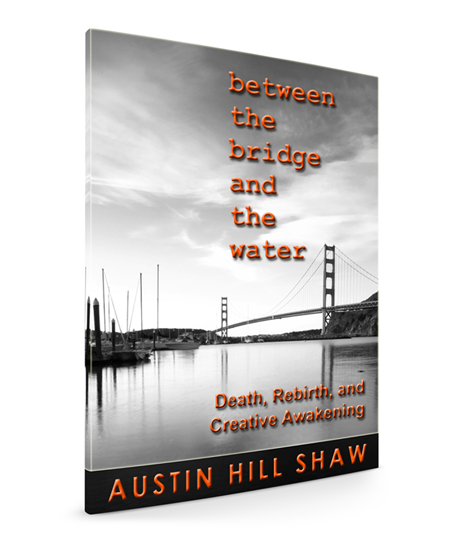 Drawing from both age-old wisdom and cutting-edge scientific research, Between the Bridge and the Water unveils important parallels between the drive to create and the desire for death, tracing them back to their common origins deep in the human psyche. “This book took me to a state of contemplation very quickly. From its factual statistics, to its haunting descriptions, to its clear descriptions about the motivations for suicide and their connection to creativity and our desire to belong as human beings, each part of it cut to the bone.” -Mark Michael Lewis, The Profitablity Coach and author of The Key Is In The Darkness: Unlocking The Door To A Spiritual Life.